Shotokan Ryu Karate Kyokai Kokusai : Go Ape! 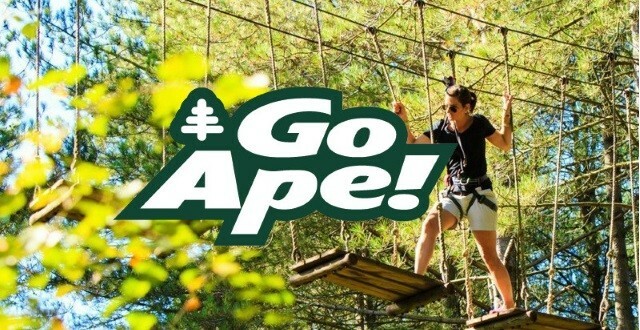 On the 27th of Sept we have a proposed social event of Go Ape. For those that are not familiar Go Ape is a tree top adventure where participants of any age can climb through the trees attempting different obstacles from tree to tree while attached to a zip wire. Each section ends with an exhilarating zip line to the bottom. I've done it before and it's great fun. There are 2 courses for different age levels so all ages from 4 can enjoy. There are also picnic areas we can reserve for ourselves to have a picnic once everyone is finished the course. I would like to find out how much interest there may be for this event to determine if we have a large enough number to put together a group. Unfortunately there are no group discounts but I have laid out the costs below and included a link to the website so people can look for themselves. Leeds Castle is our closest course so this is where we would attend. You are still welcome to come but not behave like a monkey and just watch the kids giggle. The more the merrier. Please let me know as soon as you can if you are interested then we can start to firm things up. They do offer a 15% discount for college and university students with id. Adults are encouraged to participate to be a guide with the kids. Please email info@skkk-karate.org.uk if you are interested as we will need to make a booking if we are to attend. Please let us know how many and ages as well.